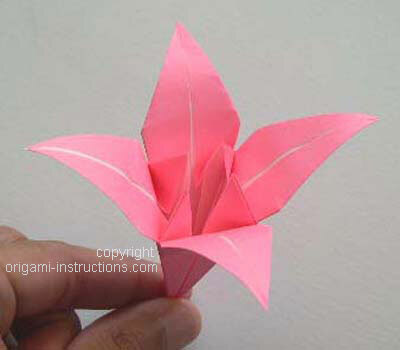 The origami lily is a classic and popular origami flower. Did you know that the lily family traditionally represented innocence and purity? Lilies can be found in a variety of hybrids and colors including yellow, pink, white, orange, purple, red and many others. 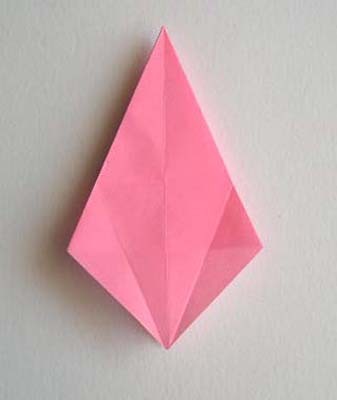 The origami lily is not too difficult to fold but beginners may find the petal fold slightly challenging. Just take your time and follow each step slowly. 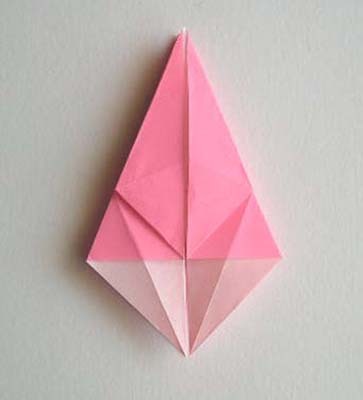 If you prefer video, check out our origami lily video instructions. Or use these Washi Origami Paper with raised patterns and subtle gold flecks. 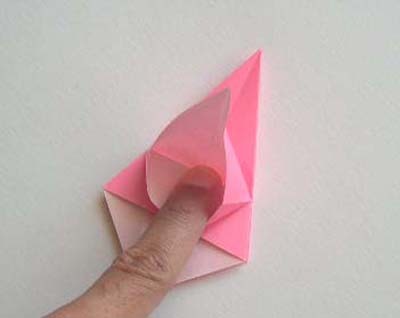 Start with a 6 inch square piece of origami paper, and fold it into a water balloon base. 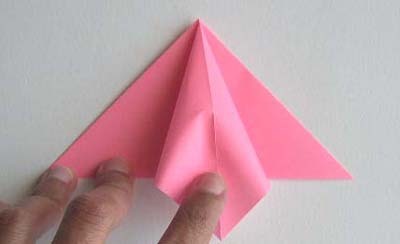 Next, take one of the four corners of the base and squash fold it as shown below. 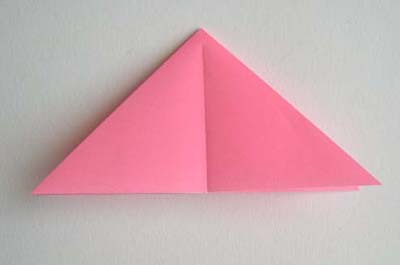 Repeat the squash fold for the other three corners, to give the kite shape shown below. 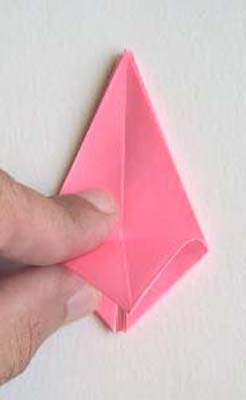 Now fold the lower edges of the kite into the centerline, then unfold. 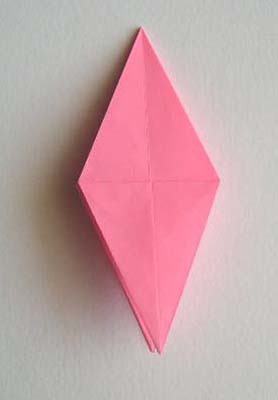 Fold the top corner down, then unfold. You will now have crease marks on the piece, that will be used in the next step. 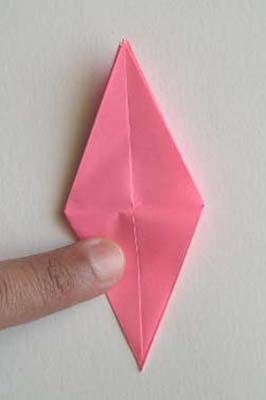 Place your finger under the lower point of the kite, and fold upwards as shown. 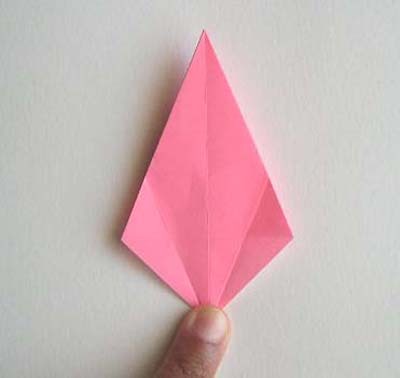 This is a petal fold. 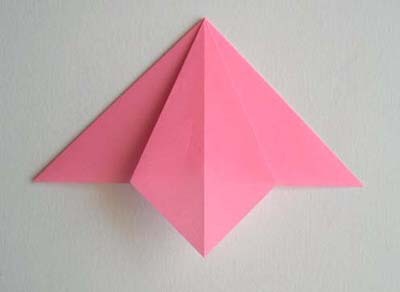 Now repeat the petal fold three more times to give another, smaller kite. 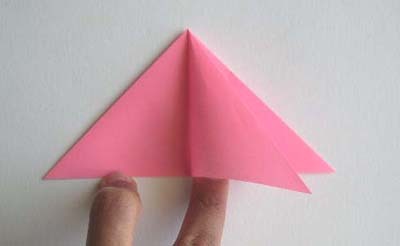 Now fold one point of the kite downwards as shown. 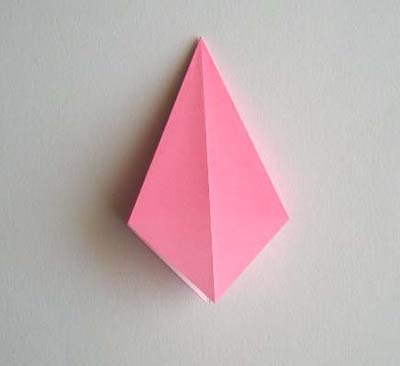 Repeat 3 more times for a diamond shape. 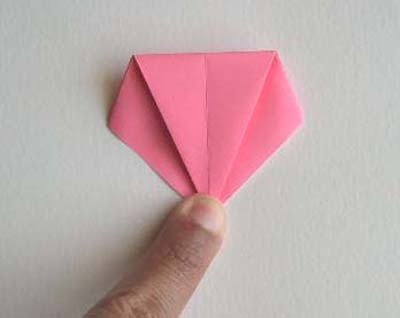 Next fold the upper edges of the diamond into the centerline. Repeat three more times. Now turn the piece upside down. 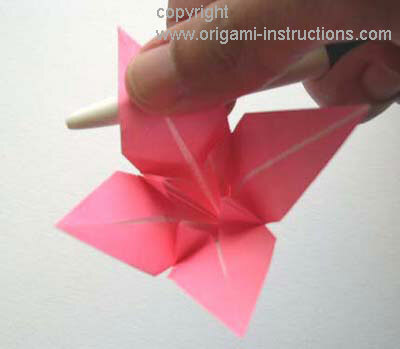 Start folding out the four petals of the flower as shown. 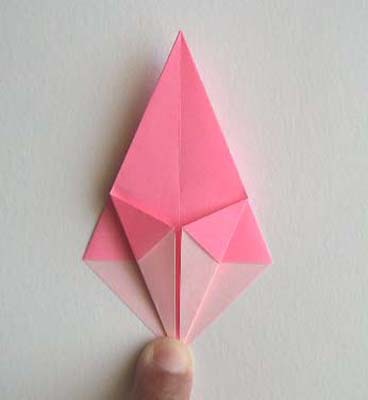 You can create a nice curling effect in the petals like this: hold the base of a petal in your left fingers, then run your right thumb and pen (or pencil) along the length of the petal. Your thumb is in front and the pen in the back. (In the picture below, we've omitted the left hand for clarity). 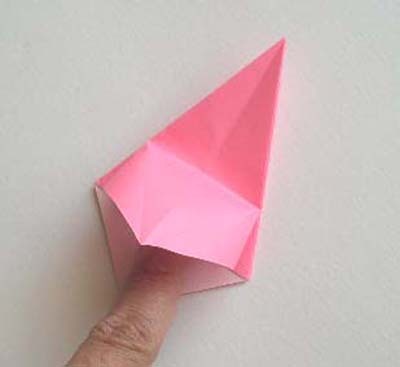 Repeat this motion several times to cause the paper petal to curl. 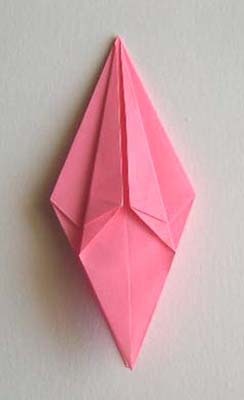 And now your origami lily is complete! 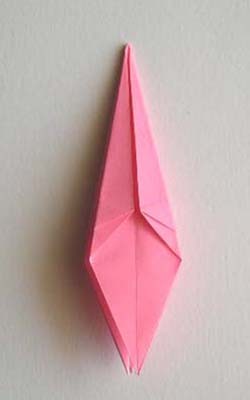 The origami lily is very popular and has been folded by many visitors of this website. Check out the readers' photo page. 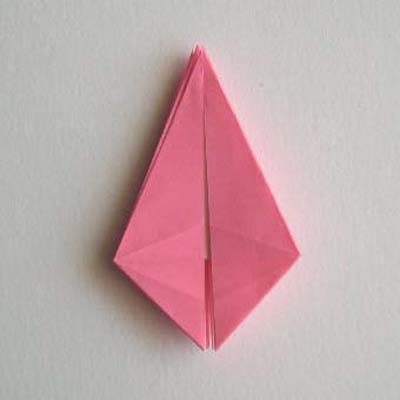 Readers have even folded and used origami lilies at their wedding!